born Giovanni Francesco di Bernardone; 1181/1182 – October 3, 1226) was an Italian Catholic friar and preacher. He founded the men’s Franciscan Order, the women’s Order of St. Clare, and the lay Third Order of Saint Francis. 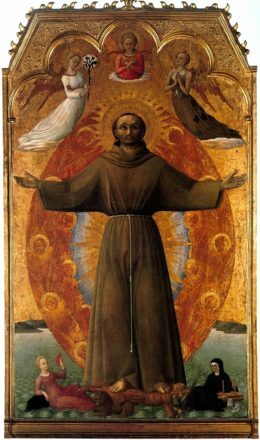 St. Francis is one of the most venerated religious figures in history. God, all powerful, most holy sublime ruler of all, you alone are good – supremely, fully, completely good, may we render to you all praise, all honor and all blessing: may we always ascribe to you alone everything that is good! ~from the writings of St. Francis.